M51, the Whirlpool Galaxy is actually two galaxies. The larger spiral galaxy (NGC 5194) is gravitationally interacting with the smaller companion, NGC 5195. M51 is an easy object in a telescope, as it is quite bright and large - magnitude 8.4 and about 11' by 7' - about 1/3 the apparent diameter of the moon. This photo is my second attempt at M51. While it is much improved over my original photo, it also enjoys the excitement of having a supernova (a large star which exploded and shines extremely bright). The supernova, designated as Supernova 2011dh and is located in the spiral arm in the lower left - at about the 8:00 position from the center of the galaxy. In this image, North is Up. This image is cropped to 64% of the original full frame. Software Used Images Plus 4.0 for camera control, calibration, and stacking. Images Plus 5.0 for digital development, advanced Lucy-Richardson deconvolution, multiresolution sharpening, star shrinking, smoothing and noise reduction. Photoshop CS5 used for levels and curves, selective color, high pass filter, star shrinking, hdr toning, smart sharpen, lab color, saturation adjustments, screen mask invert, lens correction, match color and vibrance. Gradient Xterminator for gradient removal. Carboni Tools for additional saturation adjustments, noise reduction, and smoothing. HLVG for additional color correction. Registar 1.0 for stack alignment. FocusMagic for focus restoration. Notes This is the 5th time I've processed this image, this time using my DSLR-LLRGB workflow. I'm very happy with the details, particularly the amount of faint outer "wispies" I was able to bring out. 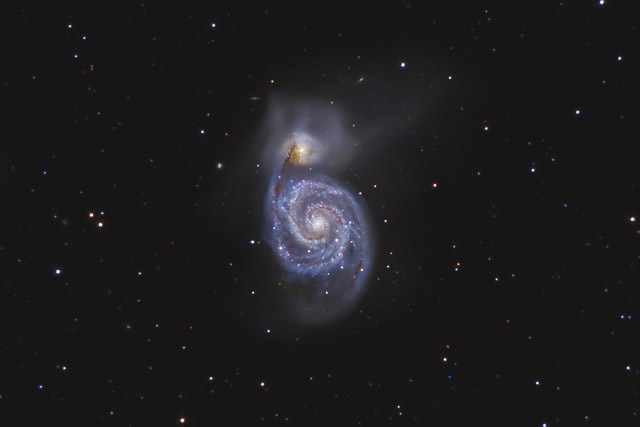 Moreover, it helps to show what I've learned since taking my original M51 in April 2011.